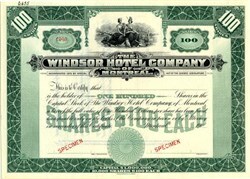 Beautiful engraved RARE specimen certificate from the Windsor Hotel Company of Montreal printed around 1900. 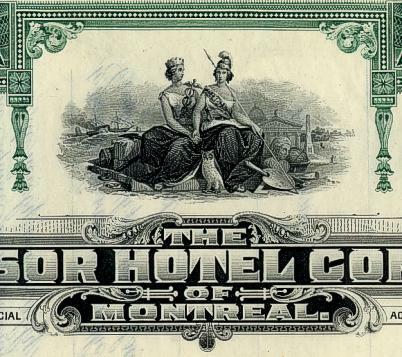 This historic document was printed by American Bank Note Company and has an ornate border around it with a vignette of two allegorical women with a city in the background. This item is over 110 years old. The Windsor Hotel (opened 1878, closed 1981) in Montreal, Quebec, Canada, is often considered to be the first grand hotel constructed in Canada, and for decades billed itself as "the best in all the Dominion". The hotel was constructed between 1875 and 1878 by a consortium of six Montreal businessmen, including William Notman. At the time Montreal was Canada's largest city, and the centre of commerce in the young country. The consortium was formed to construct an opulent new hotel to symbolize the city's growing prominence and wealth, and to serve visitors arriving at the nearby train station (which itself was replaced soon thereafter by Windsor Station). The opening gala in 1878 was the largest social gathering Montreal had ever seen, and was attended by Lady Dufferin (the wife of the Governor General), the Right Honourable Sir John A. Macdonald, Princess Louise and the Marquis of Lorne. The Windsor Hotel was soon at the centre of Montreal's social and business worlds, attracting not only railway visitors, but also business leaders, politicians, socialites, artists, and even royalty. The hotel was home to both the annual St. Andrew's Society Ball and the Winter Carnival Ball, the former being a mainstay of the hotel and of Montreal's social calendar for nearly a century. Sarah Bernhardt, Mark Twain, Dolores Costello, Rudyard Kipling, Fanny Davenport and Lillie Langtry were among the Windsor's famous guests in its early years. In 1906, a fire destroyed almost 100 guest rooms. The fire did not adversely impact the hotel's success or reputation, but simply prompted significant renovations and the addition of a new wing, known as the North Annex. The number of rooms more than doubled, going from 368 to 750, and the hotel now occupied an entire city block. The North Annex contained the famous "Peacock Alley" (named after the peacock designs in its stained glass windows), and two additional ballrooms. The success of the hotel helped draw large commercial enterprises to this part of Montreal, including Morgan's and Ogilvy's, and contributed to the slow decline of Montreal's other grand railway hotel, the Hotel Place Viger. In 1917, the owners of the Montreal Canadiens, the Quebec Bulldogs, the Ottawa Senators and Montreal Wanderers met in one of the Windsor Hotel's restaurants to form the National Hockey League. Executives of both the Canadian Pacific Railway and Grand Trunk Railway kept permanent residences in the hotel, making the Windsor home to men who controlled most of Canada's transportation infrastructure and much of its economy. In his later years, Stephen Leacock spent his winters living in the Windsor Hotel. Some of Leacock's writing, and much of his correspondence, was written on hotel stationery. During the first ever royal tour of Canada by a reigning monarch, King George VI and Queen Elizabeth stayed at the Windsor Hotel, and their arrival on May 18, 1939 attracted throngs of well-wishers to the hotel. The crowds were so large that one man died of a heart attack, many others collapsed due to heat and exhaustion, and the police found 64 children that had been separated from their parents. At a state banquet in the hotel, Montreal's francophone mayor, Camillien Houde, famously remarked in his address to the monarchs: "I thank you from the bottom of my heart for coming. And my wife thanks you from her bottom, too." In 1957, another fire destroyed a third of the hotel. This time the damage was extensive, and the original hotel structure had to be demolished. The North Annex was all that remained of the hotel, but it did contain 200 guest rooms, two ballrooms and Peacock Alley. The Windsor Hotel continued to operate out of the North Annex for almost another 25 years, but competition from newer hotels lead to the Windsor's slow decline. In 1975, Dolores Costello returned to the hotel for her seventieth birthday party, in honour of the hotel that had been her second home decades earlier. This party was perhaps the last true glimpse of the hotel's former grandeur before the Windsor's closure in 1981. In 1987, the Windsor Hotel reopened as an office building called "Le Windsor". Peacock Alley and a number of marble staircases have been preserved, and the two ballrooms are still used for banquets, wedding receptions and conferences.